Puerto Rico’s Department of Education has been getting an extreme makeover under alumna Julia Keleher. It was a Herculean task even before the catastrophic hurricane. Storms come in many forms and levels of intensity. For most of this warm January morning, Julia Keleher C’96 GEd’98 has been a crisp offshore breeze ruffling the palms. It’s the first day of classes, heralding a new year that everyone on the island hopes will be more merciful than the last one. 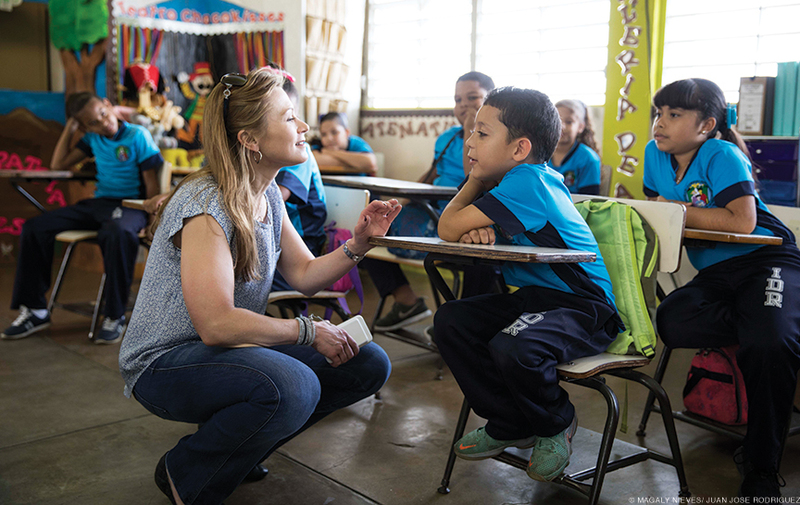 The 43-year-old Keleher, Puerto Rico’s Secretary of Education, is finishing up her third school visit of the morning—presenting a specially commissioned Three Kings Day print (artfully decorated with images of desks and backpacks), sitting in on classes, posing for selfies with high-schoolers, and giving multiple stand-up interviews in Spanish and English to the pack of TV and newspaper reporters that follow her. Most of us press types can barely keep up with her, and we’re not wearing high heels. Then, on the way back to San Juan in her government-issued SUV, the ozone suddenly crackles. The slight, intense Keleher is morphing into Hurricane Hoolia—rapid-firing into her phone from the passenger seat, while our flashing blue police lights and periodic berp-berps warn motorists to yield at intersections that still lack functioning stoplights. My own Spanish is less than excellent these days, but I get the gist of why Keleher is storming. She’s just gotten wind of a demonstration staged by community activists in Caguas, roughly 20 miles south of here. They’re demanding that a vocational school, badly damaged by Hurricane Maria, be reopened. Since that Category 5 catastrophe, students have been forced to attend classes at another high school that lacks the equipment and space to provide vo-tech instruction. Three-and-a-half months later, their ire has reached a tipping point. PLUS | In Healing the Island, how Christine Nieves C’10 is working to create a “new narrative” in one rural community. Keleher gets their frustration. What galls her is that the organizers had not tried to contact her before taking it to the streets. She believes in process, she doesn’t like getting blindsided, and the school building is a disaster. So she scolds and vents for a good 10 minutes, and when she hangs up, she casts a sidelong glance in my direction. “That wasn’t as bad as it sounded,” she says. When we talk weeks later by phone, the storm in Caguas has calmed. Keleher explains that while the schools are still sharing a building, her department is working with FEMA to get trailers or some such alternate space. “Ideally, we need to do an investment in our vocational program and rebuild some of these schools,” she adds. As we talk, my phone buloops—she’s just forwarded me a text message from a school official, accompanied by photos of the students and faculty, thanking her for helping them return to their school. She offers to put me in touch with someone who’s handling it, but by then there are so many other storms gathering that I just move on to my next question, prompted by a recent announcement from the governor’s office that includes some eye-catching numbers. Really? I ask. They’re going to close 300 more schools? She’s sitting at a conference table in one of the DE’s two large administrative buildings in San Juan’s Tres Monjitas Industrial Park section, in the middle of another insanely busy day of meetings, interviews, school visits, Twitter blasts, planning sessions, and more meetings. (“I don’t know how she does it,” says one of the DE’s regional directors. “She works 24/7. We were getting emails from her at 2 o’clock in the morning, and I’m like, ‘Oh my God, she doesn’t sleep.’”) Her observations about normality were prompted by my question about how things have changed since the first time we spoke in November. Back then, she was still coping with the adjective-defying slam of Hurricanes Irma and Maria—making sure that most of the schools across the island were open as emergency shelters and that kids were getting fed, coming up with hurricane-related learning projects, and projecting a sense of being in control of a situation that was pretty much uncontrollable. But the real storm had been brewing long before Maria. Different people point fingers in different directions, but the territory has been in a recession since 2006, and the government’s Fiscal Agency and Financial Advisory Authority blames years of “fiscal irresponsibility, ineffective leadership, and lack of long-term economic planning.” By February 2014, Moody’s and Standard & Poor’s ratings services had lowered the government’s credit rating to junk bond status. As an unincorporated territory, Puerto Rico couldn’t file for bankruptcy under Chapter 9, so in 2016, President Barack Obama signed the Puerto Rico Oversight, Management and Economic Stability Act (PROMESA), which contains some Chapter 9-like provisions. It also authorized a seven-member Financial Oversight and Management Board to negotiate the Commonwealth’s debt restructuring. (Chaired by José B. Carrion III C’92, the board’s members include Penn Law Professor David A. Skeel Jr. as well as Sebastián Negrón Reichard C’16 W’16, who serves as deputy for contract oversight and support.) By last May, long-term debt and pension obligations had reached $123 billion. When Governor Ricardo Rosselló took office in January 2017, the $3 billion budget deficit he reportedly thought he was inheriting turned out to be $7.5 billion. That is not good news for individual departments. Education, with a budget of $2.5 billion and a massive, highly centralized administrative structure, was an inevitable target. She knows that closing the schools, which should save an estimated $150 million, will cause pain in many communities. But she sees the closures as an unpleasant necessity, and one that will ultimately result in a better and safer—as well as leaner—school system. Keleher is undoubtedly sincere in suggesting that by trying to prop up an old and failing infrastructure, the protesters are—inadvertently—contributing to the academic oppression of the island. She saw her share of sub-standard conditions while working in the so-called Badlands section of North Philadelphia during her stint at Penn’s Graduate School of Education, and her indignation about both systems is palpable. But given the harsh economic realities and the class-driven nature of the debate, that argument may also be a smart political tactic. After all, those conditions post-Maria—which include black mold, leaking roofs, and live electrical wires—“would never be accepted” on the mainland, she told me in November. “It’s an injustice, a civil rights problem—a lack of access to normal standards of operation. 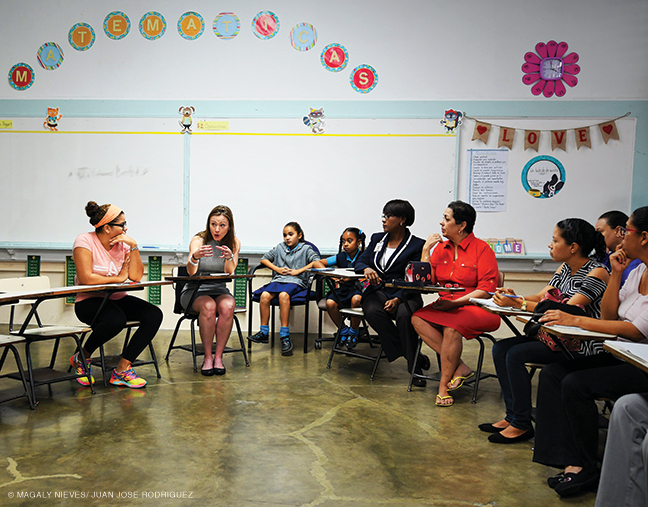 “By closing schools, rather than seeing public schools as the centers of the community that Puerto Rico needs” to help the island “recover, rebuild, and thrive, the governor is taking a step backward,” said Aída Díaz, president of the Asociación de Maestros, and Randi Weingarten, president of the American Federation of Teachers (AFT), in a joint statement. But that same day, Puerto Rico’s Senate approved the reform legislation crafted and advocated by Rosselló and Keleher, and the following day the House passed its bill (which included more than 200 amendments addressing concerns about an earlier version). Among other things, the legislation paved the way for a major decentralizing restructuring of the department, approved a limited number of public charter schools and educational vouchers, and budgeted for closing those 283 schools. It also included a modest pay increase ($1,500 a year, the first in a decade) for teachers, whose average salary is $27,000.No teachers will be laid off; those at schools to be closed will be transferred to ones staying open. When I learn about the bill’s passage, I shoot her a text asking for her reaction. “Just one small step in a big journey,” she texts back quickly. She’s a little more expansive a week later, when she posts the first entry of Julia Keleher: El Blog on the DE’s website, and at the signing ceremony at La Fortaleza, when she gives a brief but emotional speech to the assembled politicians, administrators, teachers, and students. “Since I assumed the direction of the DE,” she wrote, “I knew that my task would not be easy, that the road would be steep, full of obstacles. But every time I look at our students, I cannot stop thinking that I am on this blessed island with a purpose: to improve the quality of teaching to our students and correct the deficiencies and inequities of a system that can and should be modernized if we want our children to have a better future … There are difficult decisions to make and I know that we cannot please everyone equally, but I have to put our students first and all my decisions are and will be taken for the welfare of our children. During our various interviews, Keleher requested just one thing: a shout-out to her parents, John (GrEd’78 WEv’01) and Beatrice Keleher. She grew up in the Delaware County suburbs of Philadelphia, though she spent a lot of time in South Philly with her grandmother, and (according to a reliable source who insists on remaining anonymous) would often organize the local kids to do skits. After graduating from Cardinal O’Hara High School, she came to Penn, which she cites as having given her “excellent preparation at both levels”—including the lesson that “you’ve got to fight your way through; you’ve got to be tough; and you’ve got to work hard.” She was a poli-sci major as an undergraduate, but I suspect that her most significant academic experience was taking a semester abroad in Madrid, where she jumpstarted her impressive fluency in Spanish. Her GSE experience (specializing in psychological services) in a host of North Philly schools had an important impact, too. “I met enough kids that were struggling in a way that suggested that we could probably do this better,” she recalls. After earning her two Penn degrees, she went on to get a PhD in education leadership and administration (University of Delaware), a certificate in strategic decision-making and risk management (Stanford), and an MBA (Strayer). She put in seven years as an administrator in the Red Clay Consolidated School District in northern Delaware, then moved to the US Department of Education in 2007, where she began working with the Puerto Rican DE and later became a team leader in program risk management and monitoring, among other honors. In 2009 she started her own consulting business, Keleher & Associates, and her involvement with the DE of PR deepened. The amount of work, stress, and responsibility increased exponentially when she was appointed Secretary of Education. But when I ask her if she ever worries about burnout, she shrugs. Which doesn’t mean that she doesn’t sometimes wish she had done some things differently. Governor Rosselló is sitting in the Throne Room of La Fortaleza, the palatial governor’s residence in Old San Juan whose handsome neoclassical façade belies its 16th-century origins as a colonial fortress. The 39-year-old academic-turned-politician, son of former Governor Pedro Rosselló, was elected in 2016 as head of the New Progressive Party, which advocates for Puerto Rican statehood, among other things. He takes education seriously, having earned his bachelor’s degree in biomedical engineering and economics from MIT and his PhD in biomedical engineering from the University of Michigan, followed by several years at Duke doing stem-cell research. I ask Governor Rosselló what his charge to her was. “Very bluntly, we asked her to break the system and rebuild it again,” he says. “On the administrative side, it is a very bureaucratic system, from top to bottom. I asked her to collapse that so that there is more access, less bureaucracy, and more direct service to the students. Eleuterio Alamo, director of the DE’s San Juan region, remembers being in meetings with Keleher in 2010 when she was in charge of carrying out a Memorandum of Agreement with the US Department of Education. When she was appointed Secretary, he says he “knew that we were going to be able to make strong changes” in the system. When I asked Keleher in January what sort of feedback she was getting from teachers, she responded: “I think the teachers feel like someone’s paying attention and recognizes what they do. There’s more tension in the reaction from the school directors because I’ve been more demanding, less tolerant. I’ve been more clear about my expectations. The school director is absolutely pivotal to the success of any school system, and if they don’t do their job well, nothing works. According to Maria Christian, the DE’s chief academic officer, one of the most basic changes implemented by Keleher is a rational budgeting system. “In the US, you say, ‘Well, to educate this child for a year, there’s a price tag on it: $8,000, $10,000—whatever the school district has determined, based on resources and what the cost of living is in that area. We didn’t have that.” Under Keleher, the formula has been established for $6,400 per child. That last word is important. Many Puerto Ricans are, to varying degrees, bilingual. While there have been movements to drop English entirely in favor of the more historic colonial language, that trend has been somewhat reversed in recent years, thanks in part to the internet and other trappings of the modern world. Keleher hopes students will “fully master” both Spanish and English, and bilingual schools are another component of the reform package. But Spanish is still the island’s primary tongue, which affects everything from teachers’ ability to keep up with the latest developments in the field to—theoretically—textbooks. That second issue is often moot, however. “The department hasn’t formally purchased books in over 10 years,” notes Maria Christian ruefully. For a variety of reasons, some schools have textbooks; others don’t. When she arrived last summer, Christian recalls, the department was exploring the cost of providing every student in the system with a Kindle or equivalent. Most school districts do a gradual rollout with such things, starting with a single grade or a group of kids. Puerto Rico has been called the “oldest and most populated colony in the world” by its current governor. Its singular history and its continued state of dependence—not to mention its lack of representation in Congress— has repercussions that are very much felt today. Keleher acknowledges that history, and muses about its effect on the island’s educational system. “I would be wrong to imagine a world where I just stepped in today and began to design the future,” she says. “We got here through a series of events. Even something so simple as the [Territorial] Anthem, which has changed multiple times here, and the names of the schools that are named after major cultural figures—like [poet] Lola Rodríquez de Tío—it’s very important to be sensitive to who those individuals are, the paths they traveled, and the inroads they made.” But it’s also important to make sure that knowledge and that worldview don’t somehow constrict students’ potential for learning and moving forward. One of her responsibilities, then, is “creating a generation of critical thinkers, individuals who know how to seek out information, who can interpret the things that are said to them, and who come to their own conclusions”—not whether they should follow “this party or that party or the other party. Now that Keleher has survived two major hurricanes, endured strikes and demonstrations and some pointed name-calling, been praised in high places and helped move a major piece of legislation across the finish line, I wonder if she’s finally starting to feel like a Puertorriqueña. Keleher IS an Education hit woman. Hired to DESTROY not only public education in Puerto Rico, but to IMPOSE a foreign educational system with absolutely no Puerto Rican context regarding our history, culture, traditions and values; for which she is COMPLETELY IGNORANT. Her mission is to produce servants for the new “Puerto Ricans” (the US millionaires that are buying the island) Right now she is hiring in the US “mentors” for Puerto Rican children, and as she closes schools and layoffs teachers, she will pay them $150,000. Tell me if this is not a hired gun! Keleher GO HOME!!!! This is jaw-dropping chauvinism and ignorance. Calling colonizer Keleher a “badass” for ignoring the demands of Indigenous protesters? This woman steals hundreds of thousands of dollars annually from the people of Puerto Rico to pay her absurd salary. Shame on everyone involved in this disgusting propaganda campaign for the Junta Fiscal. The manufacturing of consent. Here on clear display, for everyone to see. Down with Rosselló, the Junta, and the Agent Orange, Penn’s favorite son. Us Puerto Ricans do not deserve what is happening as the aftermath of the climate event. No human being, no people deserve this. Just for the he financial gain of some souless beings or corporations. Like in any conventional attack or war, the pillage against our island has been worst than the event itself. We want this education hit lady to go home. K-hell go home. She is part of the destruction and looting. Schools are being closed, some are handed out to the wrong people, or set up for a failed education system for financial gain, imposed without the participation of interested parties, like teachers and parents. Students including special education children are suffering the consequences of this destruction. The citizens audit of the Puerto Rican debt is imperative, with real urgency. The financial scheme has to be revealed. There has to be transparency. Our people are being penalized by by an imposed junta. The imposed junta is destroying our people, and our island is being sold piece by piece. And this needs to stop.